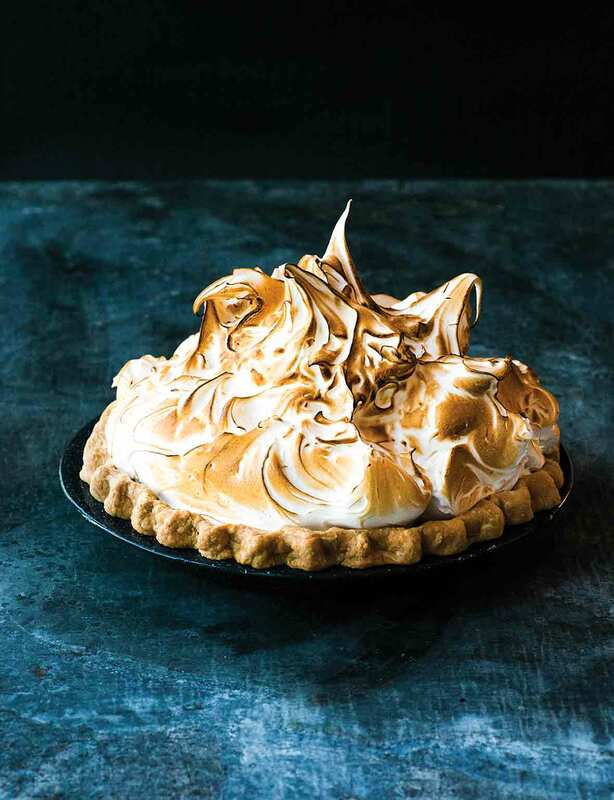 This lemon meringue pie is made with a buttery pâte brisée or store-bought pie crust filled with sweet-tart lemon custard and topped with clouds of meringue. The best version we’ve had of an American dessert classic. 1. Lightly coat an 8- or 9-inch (20- or 23-cm) pie pan with cooking spray. On a lightly floured work surface, use a rolling pin to roll the pâte brisée into a 15-inch (38-cm) circle with an approximate thickness of 1/8 inch (3 mm). Gently fold the circle in half and then in quarters and transfer it to the prepared pie pan. Position the tip of the folded pâte brisée in the center of the pie pan and carefully unfold it, gently pressing the pâte brisée into the bottom and sides of the pie pan to prevent air gaps. Roll the overhang under itself along the edge of the pie pan and flute, using 2 fingers to pinch the pâte brisée in a decorative crimp. Place the pie crust in the freezer for at least 1 hour before baking. 2. Preheat the oven to 375°F (190°C). 3. Remove the pie crust from the freezer and place it on a rimmed baking sheet. Line the pie crust with parchment paper and fill it with pie weights or dried beans. Bake until the crust is golden and opaque, 25 to 30 minutes. Remove the parchment paper and pie weights, and continue to bake, uncovered, until the bottom of the pie crust is opaque and light golden brown, about 10 minutes more. Let cool on a wire rack and decrease the oven temperature to 350°F (175°C). 4. In a medium saucepan over medium heat, combine the sugar, cornstarch, and salt and then whisk in the water and 3/4 cup of the milk. Stir constantly with a heat-resistant rubber spatula until the mixture thickens slightly and coats the back of the spatula, 5 to 8 minutes. Remove the saucepan from the heat. 5. In a medium bowl, whisk together the egg yolks and the remaining 1/4 cup milk. Slowly pour about 1/4 cup of the warm cornstarch mixture into the yolk mixture and whisk together to temper it. Whisking constantly, gradually pour the remaining cornstarch mixture into the yolk mixture and whisk until fully incorporated. 6. Pour the yolk mixture into the saucepan and return it to medium heat. Add the lemon juice and zest and whisk until the mixture comes to a gentle simmer. Toss a few pieces of butter at a time into the pan and whisk until the butter is incorporated before adding a few more pieces. Repeat with the remaining butter. Then remove the saucepan from the heat. The mixture will be thicker than before. Gently pour the lemon custard into the cooled pie crust. 7. Bake the pie until the filling is just set yet still wobbles a bit in the center when you gently shake the pan, about 15 minutes. Let cool on a wire rack. Keep the oven on. 8. While the pie cools, on a rimmed baking sheet lined with parchment, spread the sugar in an even layer. Place the baking sheet in the oven for 8 minutes. 9. Meanwhile, place the reserved egg whites in a clean, dry bowl of a stand mixer fitted with the whisk attachment. Whisk on medium speed until the egg whites are frothy. 10. Remove the heated sugar from the oven and increase the oven temperature to 400°F (205°C). Carefully lift the parchment paper with the sugar and slowly tip the sugar into the whipped egg whites. Whisk on high speed until the meringue is shiny and glossy and forms medium-stiff peaks, anywhere from 3 to 10 minutes. Decrease the speed to medium-low and beat for 1 minute more to stabilize the meringue. 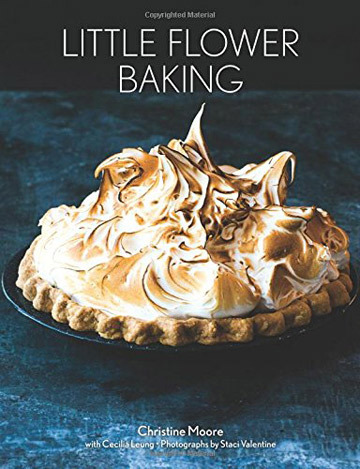 Use a rubber spatula to gently and generously mound the meringue onto the cooled pie filling, completely covering the filling and making meringue swoops and peaks all over the surface of the pie. This lemon meringue pie recipe fulfilled my expectations of a homemade lemon meringue pie. It was simple enough and I had no issues with my lemon custard setting. I used Leite Culinaria's brisee and it was excellent! If you already have the brisee baked and ready to go, it only takes about 2 hours or so to finish up the pie. Also, one thing to make it easier while cooking is to have your eggs separated, at room temperature, with the milk already in it so it's all ready to go when your cornstarch mixture is done cooking. It can be a little bit tricky in determining when the nappe is done, but if you understand what you're looking for, you’ll be okay. If you have any doubts, you can always Google nappe beforehand to get a better feel. Overall, it’s great to have homemade lemon meringue pie! After adding the sugar, my meringue turned glossy and had stiff peaks in like 2 minutes, way faster than the time on the recipe. I think I beat it for about 3 minutes overall. Did you know that August 15 is Lemon Meringue Day? Well, this is the perfect recipe for an all-American favorite that dates back to the 19th century. Although this recipe has a few different components, the end result is a perfect balance of sweetness and citrus from the fresh lemon juice and zest. The unique method of heating the sugar and adding it to the egg whites is brilliant. The result is a much easier version of Swiss meringue. It made a generous amount so I just piled it high. I actually prepared the pie shell the night before and put it in the freezer. I took it out the next day about 30 minutes before putting it in the oven. It was a bit of work but well worth it. Resist cutting into the pie until it is completely cooled. I didn’t refrigerate the pie as some do but instead kept it overnight in my microwave. So, when life gives you too many lemons, make this pie! Lemon Meringue Pie Recipe © 2016 Christine Moore. Photo © 2016 Staci Valentine. All rights reserved. All recipes and photos used with permission of the publisher.